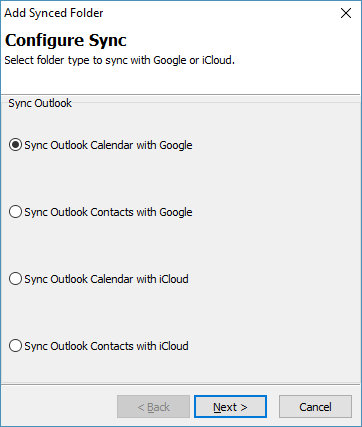 Automatically sync your Outlook calendar and contacts with Google or iCloud. Access Outlook calendar and contacts on your Android phone or iPhone/iPad. Add-in supports one-way synchronization (transfers changes only from Outlook to Google/iCloud or Google/iCloud to Outlook) or two-way syncing. 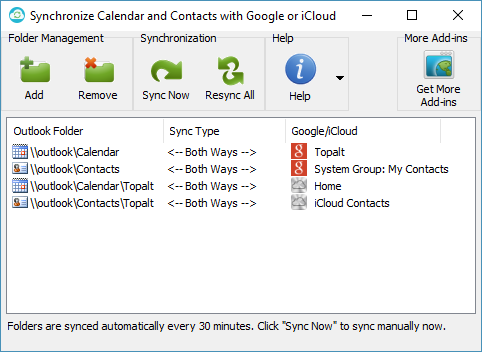 Synchronization happens automatically - after you make any changes to Google/iCloud or Outlook or can be triggered manually. Try it free! Sync Outlook calendar and contacts with iPhone. Sync Outlook calendar and contacts with Google Android. Easy to use for beginners, powerful for advanced users. 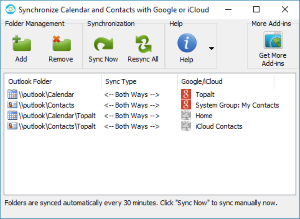 Synchronize Outlook calendar and contacts with Google/Gmail or iCloud automatically. Use Outlook calendar with the Android phone or iPhone/iPad. Use one-way or two-way syncing. Works with latest Outlook 2016 and older Outlook 2013, 2010, 2007 and 2003 (both 32 and 64-bit versions). You can try add-in for free for 14 days. Click Download Now to download a free trial. Click Order Now to get the full version for only $29.95. Volume discounts and multiple currencies available, visit order page for more information.